Benicia’s rejection of plans to bring trains filled with crude oil to Valero Corp.’s big refinery in the city was hailed Wednesday by critics of the country’s expanding oil-by-rail operations, who hope the flexing of local power will reverberate across the Bay Area and the nation. Of particular interest to environmentalists and local opponents, who for years have argued that Valero’s proposal brought the danger of a catastrophic spill or fire, was a last-minute decision by U.S. officials that Benicia’s elected leaders — not the federal government — had the final say in the matter. Word of that decision arrived just before the City Council, in a unanimous vote late Tuesday, dismissed Valero’s proposal for a new $70 million rail depot along the Carquinez Strait off Interstate 680. Valero had said the project would not only be safe but bring local jobs, tax revenue and lower gas prices. As oil production has boomed across North America, so has the need to send crude via railroad. The uptick in tanker trains, though, has been accompanied by a spate of accidents in recent years, including a 2013 derailment in the Quebec town of Lac-Megantic in which a 72-car train exploded and killed more than 40 people. The authority of communities to limit oil trains has been clouded by the assertion of some in the petroleum industry that local officials don’t have jurisdiction to get in the way. Companies like Valero have contended that railroad issues are matter of interstate commerce — and hence are the purview of the federal government. Shortly before Tuesday’s meeting, however, Benicia officials received a letter from the U.S. Surface Transportation Board, which wrote that Valero, based in Texas, was not a railroad company and that the proposed rail terminal fell under city jurisdiction. “It’s what I was waiting for to help me make my vote more defensible,” said Councilman Alan Schwartzman at the meeting. Earlier this year, Valero had asked the Surface Transportation Board for “preemption” protection for the project after Benicia’s Planning Commission rejected the proposal. The plan proceeded to the City Council upon appeal. The plan called for oil deliveries from up to two 50-car trains a day, many passing through several Northern California communities en route from the Bakken shale formation in North Dakota. Those trains would carry as many as 70,000 barrels of oil. The company billed the project as a way to keep gasoline prices low in the absence of a major oil pipeline serving the West Coast. Crude is currently brought to the Bay Area mostly by boat or through smaller pipelines. On Wednesday, Valero officials expressed frustration at the city’s decision. The vote directly hit the city’s pocketbook. Nearly 25 percent of Benicia’s budget comes from taxes on the oil giant, and the city coffers stood to grow with more crude. The refinery employs about 500 people, according to city records. But the city’s environmental study showed that oil trains presented a hazard. The document concluded that an accident was possible on the nearly 70 miles of track between Roseville (Placer County) and the refinery, though the likelihood was only one event every 111 years. The document also suggested that much of the crude coming to the Bay Area from North Dakota, as well as from tar sands in Canada, was more flammable than most. Several cities in the Bay Area and Sacramento area joined environmental groups in calling for rejection of the project. At least two other plans are in the works for oil delivery by rail elsewhere in the region — in Richmond and Pittsburg. 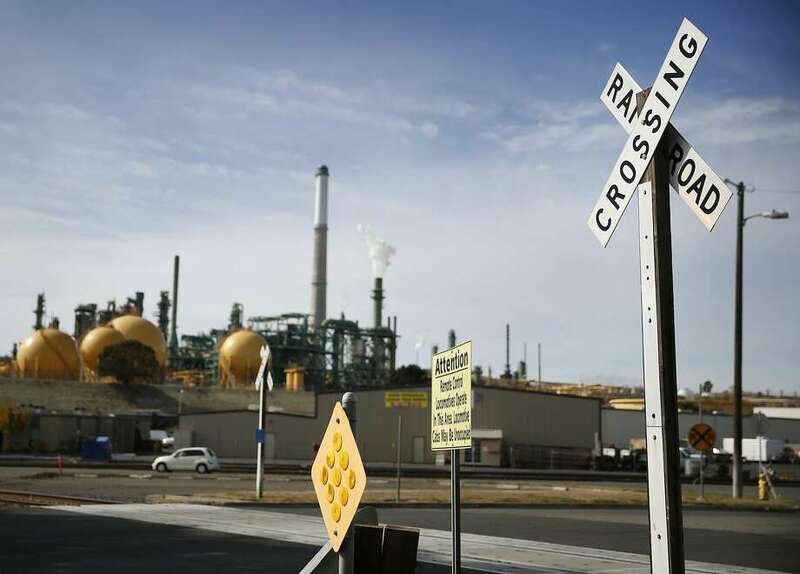 A handful of other proposals have been put forth in other parts of California, including the expansion of a rail spur at a Phillips 66 refinery in San Luis Obispo County, which is scheduled to be heard by the county planning board Thursday. Prange, with the Natural Resources Defense Council, said this week’s finding by the Surface Transportation Board gives cities the confidence to reject the proposed oil trains, if they wish to do so. “It reaffirms the power of local government to protect their citizens from these dangerous projects,” she said. U.S. oil deliveries by rail have grown quickly, from 20 million barrels in 2010 to 323 million in 2015, according to government estimates. In response, federal transportation officials have worked to improve the safety of oil-carrying cars with new regulations. But over the past year, rail deliveries nationwide have slowed, in part because of the stricter rules as well as local opposition, falling crude prices and new pipelines. Critics have complained that the tightened rules have fallen short, pointing to incidents like a June train derailment in Mosier, Ore., which spilled hundreds of thousands of gallons of crude into the Columbia River. Leaders in Oregon are discussing a statewide ban on crude trains. Kurtis Alexander is a San Francisco Chronicle staff writer. BENICIA >> Environmentalists hoping to defeat Benicia’s crude-by-rail project scored a huge victory Tuesday night, handing Valero Refining Company a significant defeat in the process. In a unanimous decision from Mayor Elizabeth Patterson and Benicia City Council, Valero’s application for a conditional use permit for a crude oil off-loading facility was denied. Vicki Dennis, who moved to Benicia two years ago, was one of many present at City Hall and said she was “just delighted” with the decision. The City of Benicia’s Planning Commission first began considering the issue in December 2012 when the refinery submitted an application seeking permission to build infrastructure to bring two 50-car trains a day carrying up to 70,000 barrels of North American crude oil into Benicia. In March, the Planning Commission voted unanimously to deny the application and to not certify an accompanying environmental impact report. The decision was made against the recommendation of city staff who said the project’s involvement with rail-related issues made the decision a federal issue. Valero representatives submitted an appeal looking to reverse the commission’s decision to deny their application, and the matter was postponed until Sept. 20. As part of the appeal, Valero sought a declaratory order from the Surface Transportation Board on the issue of federal preemption in regards to the project. During this time, many governmental agencies, private organizations and individuals publicly opposed the city council’s decision to transfer authority on the matter to the federal government. At the city council meeting Tuesday, however, public comment on the topic was officially closed. This drew a few hushed laughs from the crowd of approximately 150 people who had shown up to witness the landmark decision at Benicia City Hall. Mayor Patterson’s warning didn’t stop a few concerned citizens from indirectly talking about the issue. “Since I can’t talk about what the Surface Transportation Board has just done, I would urge the council to support the struggle against the Dakota Access pipeline,” said another man. The denial resolution highlighted specific issues that city council members had with Valero’s proposed project, including the unclear traffic impacts of having an unregulated shipment schedule, spill risks associated with shipping by rail and the project’s uncomfortable proximity to the city’s waterways. Before making a judgement, Council members took turns voicing their concerns about health, safety and the project’s effect on the environment. “When we first started considering this, there seemed to be little risk involved,” said Councilwoman Christina Strawbridge. “After four years, the community has endured numerous public hearings with hundreds of people speaking about the project. During this time, there have been 13 derailments around the country involving multiple carriers. After the council’s comments, Councilmember Tom Campbell put forward a motion to deny, and was seconded by Patterson. A quick vote was taken and the motion to deny Valero’s presence in Benicia was decided. Misao Brown, a retired teacher and environmental activist from Alameda, was thrilled with the council’s decision and was seen embracing her friends outside of Benicia City Hall. Human error blamed for freight train derailment in heart of the city after a Canadian Pacific Railway train collided with another on Sunday morning. Human error is being blamed for a freight train derailment in the heart of Toronto Sunday morning that had crews scrambling to contain a diesel fuel leak. The derailment happened after a train struck the tail of another train at about 5:20 a.m. near Dupont and Bathurst Sts., Canadian Pacific Railway spokesperson Martin Cej told the Star. No one was injured in the collision and subsequent derailment and the diesel fuel leak, which Toronto police said had not been a threat to public safety, was quickly contained. Cej said that one car was carrying batteries and aerosols, which are classified as “dangerous goods” under Canadian regulation, but they did not leak, he confirmed. City councillor Josh Matlow raised new concerns Sunday about freight trains running through densely populated neighbourhoods. “While it was incredibly fortunate no one was hurt today, this derailment should act as a wake-up call for the federal government to move swiftly on rail safety,” he said. This spring, Mayor John Tory, Matlow and 16 other councillors whose wards are nestled by rail lines, signed a letter sent to Marc Garneau, the federal Transport Minister, calling for better rail safety. The 2016 federal budget allocated $143 million to be used over three years to improve rail safety. Cej said “early indications” point to human error as the cause of Sunday’s collision and derailment and that equipment failure was not a factor. Bartlett Ave., north of Dupont, was closed while police and rail officials investigated the incident. Although there were no dangerous goods on board either train Sunday, roughly 9 per cent of goods transported by CP in Ontario are regulated dangerous goods, according to a disclosure to Transport Canada for 2015. A 2014 investigation by Star reporter Jessica McDiarmid monitored CP’s rail line that crosses Barlett Ave. on its way to Dupont St. in the Junction before it goes northward, west of the Don Valley. Between two 12-hour shifts, 7 a.m. to 7 p.m. and 7 p.m. to 7 a.m., the Star found that more than 130 cars and tanks carried dangerous goods such as crude oil, methyl bromide and ethyl trichlorosilane, and more. A little over three years ago, a train hauling 72 cars of crude oil, derailed in Lac-Mégantic, Que. It resulted in an inferno that killed 47 people, and spilled six million litres of crude. Since the 2013 Lac-Mégantic disaster, rail companies are required to provide information to municipalities for emergency planning, however, under strict confidentiality agreements. Canada’s largest railroads already did this upon request. In February 2015, the federal government introduced a bill that increased the amount of insurance railways must carry to cover costs in the event of a derailment.